For the rest of this week, through midnight on January 20, 2019, when you buy two of these gorgeous pendants – any two, your choice – you get the third one free. You just have to tell me which one. Birthday presents? A gift for your mom? For your bestie? For you (equally valid!) – This is the time. Buy two, get one free. Love it! Cyber Monday – buy two get one free! 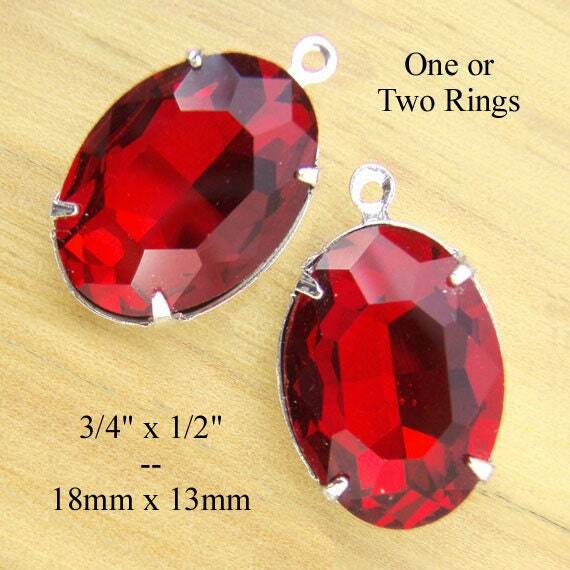 Of course there are more than red glass gems available – I just felt like featuring Christmas-y ones. 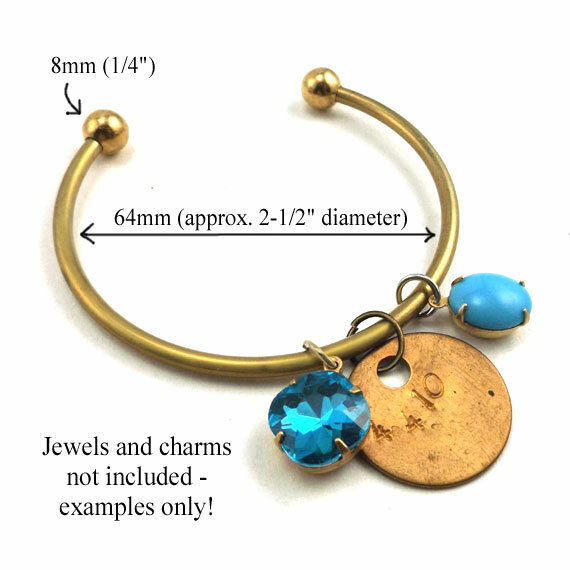 Remember – buy any two items (pairs, or pendants, or charms) – and get your third item free! Equal or lesser value (but that covers a lot of territory). Just contact me when you buy two items, and say “Cyber Monday sale”, and tell me what your extra gift will be! Sometimes you want rich color! 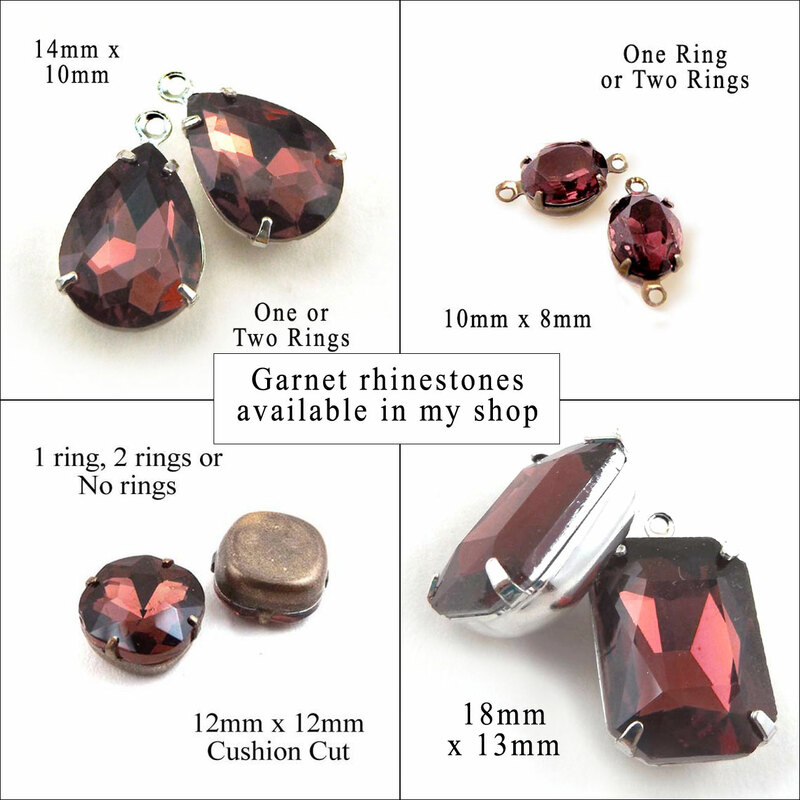 I’ve just gotten a new supply of these gorgeous red rhinestone ovals – perfect rhinestone pendants and earrings. 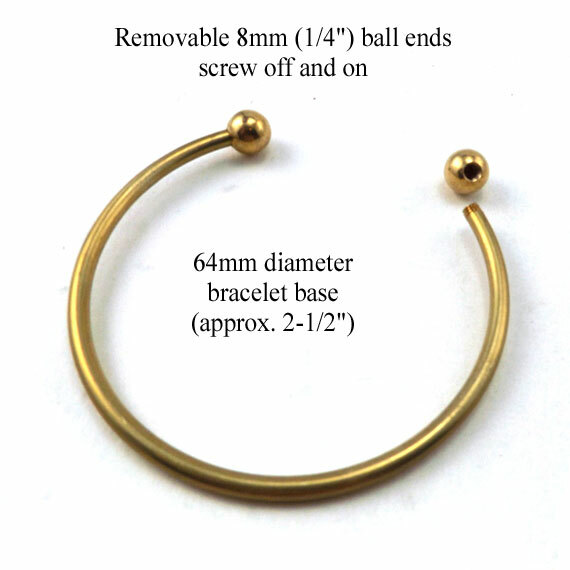 Or connectors, if you use two-ring (two-loop) settings. Of course these red glass gems would be wonderful for Christmas – but truly they are fabulous year-round. Make red a new “neutral” with black, brown, navy, gray – it brightens your whole outfit. And right now, I’m offering a buy-one-get-one-free BOGO special! From today through midnight on October 12, 2018, when you buy one pair of these pretties, you can get a second pair free (or dicker for another pair of rhinestones, equal or lesser value). So don’t wait. 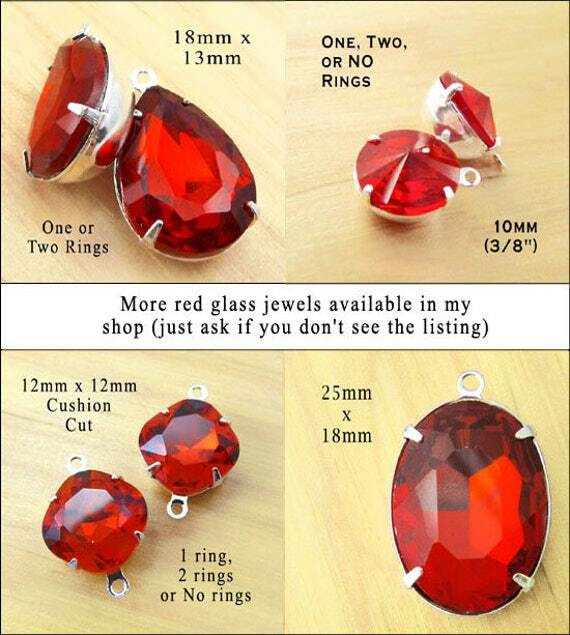 Red glass gems – wonderful for you or a DIY gift – and they’re on sale! Blue zircon or teal blue glass beads – and a BOGO sale! Woo hoo! 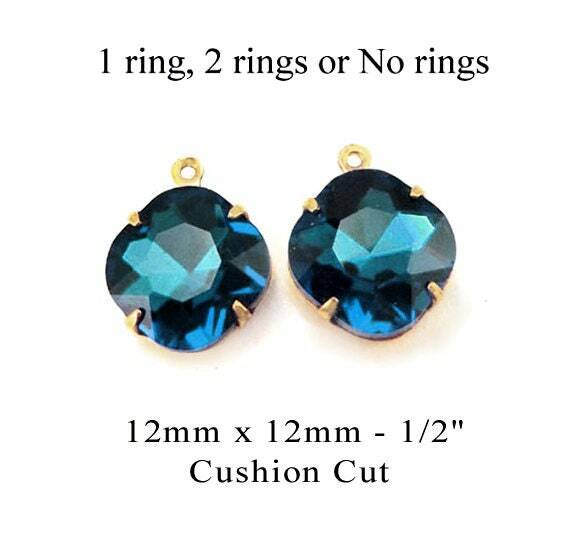 I’ve just gotten in some gorgeous new blue zircon, cushion cut octagon rhinestones. 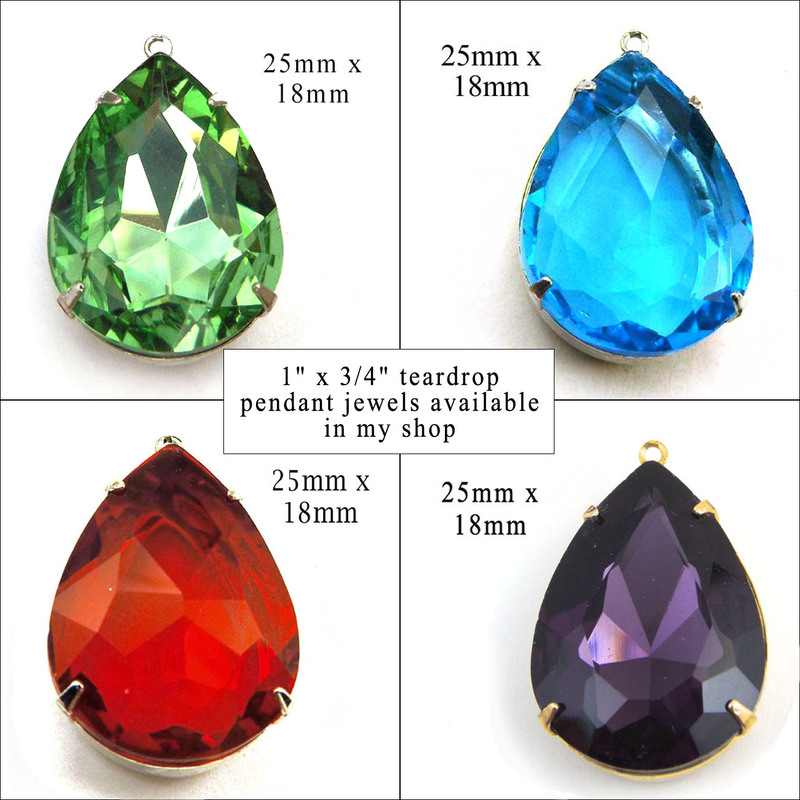 These are wonderful earring drops, mid-size pendants (classic traditional shape to nestle at the base of the throat) – or glass connectors, when you use two-ring settings. 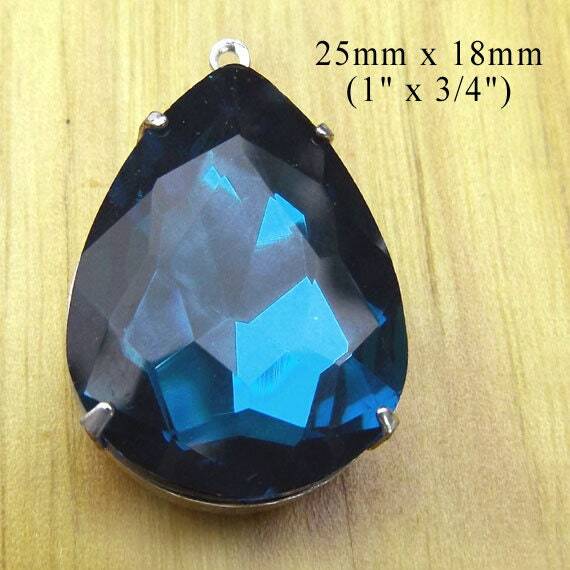 I’ll be posting some more blue zircon glass gems soon. 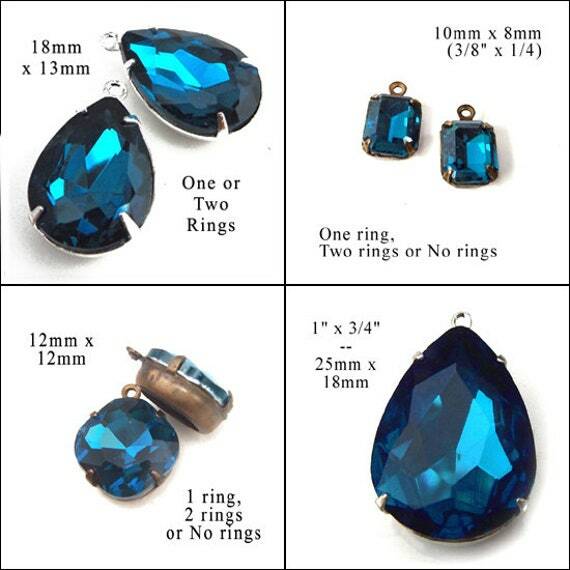 The color is such a gorgeous dark teal blue – lovely for fall, and flattering for just about everybody. And right now, I’m offering an introductory BOGO sale! 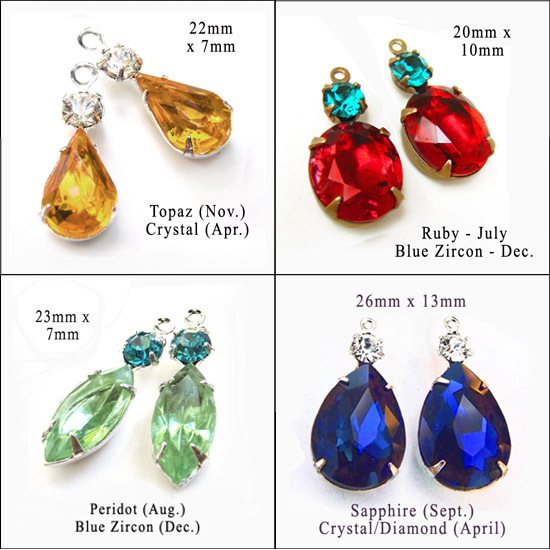 Buy one pair, get one free (and you can dicker for another jewel for your freebie if you want). From today through September 12, 2018 at midnight, the BOGO sale is good – while supplies last anyway – so don’t wait! I recently had a customer ask me to prepare some special glass jewel combinations – in her daughter’s school colors. She wanted to make some earrings in the colors of the school’s football team – she thought they’d be a good fundraiser item. And of course there are lots of shapes you could choose – teardrops or rounds, octagons or navettes – I just had these pics prepared already. Chances are good that I have, or can get, jewels in your team colors. And with that in mind – here’s the Special Offer I mentioned. 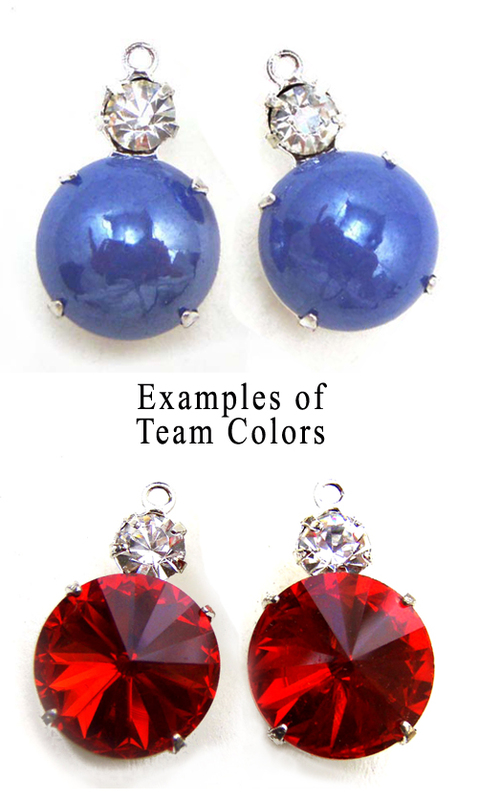 Order ten or more pairs of identical jewels in your team colors – and get 20% off. This is only good till 12/31/15 and you have to mention your team to me when you order. That’s it though – mention your team, order 10 pairs of the same jewels, and get 20% off.